- Math Print - Input and view math symbols, formulas and stacked fractions exactly as they appear in textbooks. - Scroll through history - Scroll through the history of calculations, recall an input/output. - Free download- Flash applications available to download. The TI-84 Plus Pocket SE graphing calculator comes with a USB cable, plenty of storage and operating memory, and lots of pre-loaded software applications (Apps) -- all to help you gain an academic edge from pre-algebra through calculus, as well as biology, chemistry and physics. 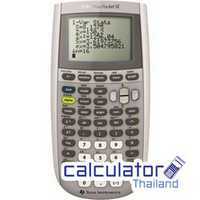 Count on TI calculators at exam time. You can use this TI graphing calculator on the PSAT, SAT, and ACT college entrance exams and AP tests and the International Baccalaureate® (IB). * It is also approved for use in GCE A-LEVEL. • 2.5 times the processor speed of the TI-83 Plus. • 1.5 MB FLASH ROM memory for data archive and storage of Apps. • 24KB of available RAM memory. • USB port for computer connectivity, unit-to-unit communication with TI-84 Plus Pocket SE graphing calculator. • I/O port for communication with other TI products. • Internal Clock with date and time display. • TI Connectivity Cable included. and printed or stored on disk. • Included Apps: Cabri® Jr., Transformation Graphing, Inequality Graphing, Topics in Algebra 1, Chapters 1-4, Topics in Algebra 1, Chapter 5, Fundamental Topics in Science, CellSheet™ (English, French, German and Spanish versions), Periodic Table (English, French, German and Spanish versions), Organizer (English, French and Spanish versions), StudyCards™ (English, French, German and Spanish versions), Science Tools (English, French and Spanish versions), Conic Graphing, Learning Check™, Area Formulas, Catalog Help, Polynomial Root, Finder/Simultaneous Equation Solver, Puzzle Pack, Vernier EasyData®, Spanish Localization, French Localization, German Localization, Danish Localization, Swedish Localization, Dutch Localization. • Apps are available from TI and other leading developers. • 8-line by 16-character display. • Advanced functions accessed through pull-down display menus. • Real and complex numbers calculated to 14-digit accuracy and displayed with 10 digits plus a 2-digit exponent. • Graphs 10 rectangular functions, 6 parametric expressions, 6 polar expressions, and 3 recursively-defined sequences. • Up to 10 graphing functions defined, saved, graphed and analyzed at one time. • Sequence graphing mode shows time series plot, cobweb/stair-step plot and phase plots. • User-defined list names. Lists store up to 999 elements. • 14 interactive zoom features. • Numeric evaluations given in table format for all graphing modes. • Interactive analysis of function values, roots, maximums, minimums, integrals and derivatives. • 7 different graph styles for differentiating the look of each graph drawn. • Horizontal and vertical split- screen options. • Stores up to 10 - 50x50 matrices. • Matrix operations including inverse, determinant, transpose, augment, reduced row echelon form and elementary row operations. Convert matrices to lists and vice-versa. • List-based one- and two-variable statistical analysis, including logistic, sinusoidal, median-median, linear, logarithmic, exponential, power, quadratic polynomial, cubic polynomial, and quartic polynomial regression models. • 3 statistical plot definitions for scatter plots, xy-line plots, histograms, regular and modified box-and-whisker plots, and normal probability plots. • Advanced statistics features including 10 hypothesis testing functions, 7 confidence interval functions and oneway analysis of variance. • 15 probability distribution functions including Normal, Student-t, Chi-square, Binomial, and Poisson. • Business functions including Time-Value-of-Money (TVM), cash flows, and amortization. Full screen interactive editor for solving TVM problems. • Interactive equation solver editor allows solving numerically for different variables in an equation. • Alphabetical CATALOG of all TI calculator operations in one menu. • Programming capability with the number of programs limited only by available memory. • Link with another TI-84 Plus Pocket SE. Receive lists L1-L6 from TI-82. • USB Unit-to-unit link cable included. • TI ViewScreen™ unit available that is compatible with the same TI ViewScreen LCD panel as the TI-82/TI-83 and the TI-Presenter™ Video Interface. • All TI-84 Plus Pocket SE student models can plug into the TI ViewScreen LCD panel and TI-Presenter Video Interface with TI-84 Plus Presentation Link™ adapter. • Compatible with Calculator-Based Laboratory™ 2 (CBL 2™), Calculator-Based Ranger™ (CBR™), Vernier EasyLink® and Vernier EasyTemp® systems to allow collection and analysis of real-world data. • Compatible with the TI-Navigator™ Classroom Learning System. • Powered by 4 AAA batteries with a Silver Oxide battery backup to protect RAM memory during main battery change.